You find yourself saying things like "argh, I've blown it again, I'll eat healthy again tomorrow!.." Your eating habits can range from supermodel yoga enthusiast to hungry, unsupervised child in a candy store. You sometimes find yourself rummaging the fridge after dinner to eat last week's leftover apple pie. What the hell, I’m not even hungry?! 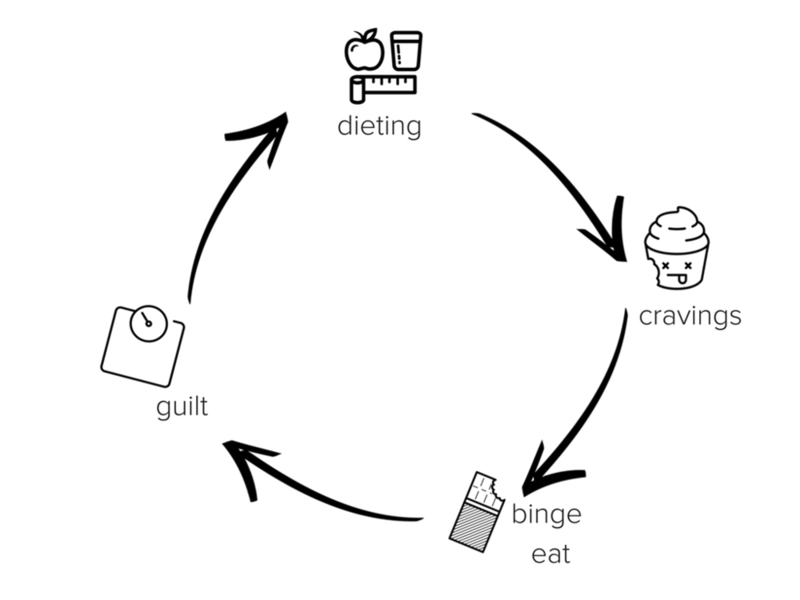 And… this loop sounds really familiar: overeat → feel terrible → get all judgey → repeat. You’re smart, savvy and health-conscious, yet you're constantly falling off the wagon! You’ve shifted to a kinder, more “normal” way of eating. You’re able to listen to what your body needs and respond in a way that feels really good. You’re able to say “as good as I know that pizza tastes, it’s just not appealing to me right now. I’m not hungry”. You’re able to buy your favourite chocolate, forget about it and let it hang around in your fridge for a week. When you feel like something sweet you calmly eat a few squares and then wrap it up for later. It’s no big deal. And you know what?..I can help you get there. You already know you need to eat healthy, stop overeating, manage cravings, and stay motivated. You know what you should be doing...the tough part's actually doing it. I promise you it’s not because you don't have enough “willpower” or you need to learn more about "wellness". It’s more likely that there’s something else going on. That actually the diet-binge cycle you’ve been battling for so long is a natural symptom of something else… and not the problem itself. Getting help from your program has been like finding the missing piece of the puzzle for me. What you've helped me understand has given me so much freedom in just a few days! A 1:1 coaching session + guidebook combo that's about trying different instead of harder. Cake without Chaos lays the groundwork to finally pick yourself up and brush yourself off so you can start to trust yourself around food again. You’ll have better tools to cope with cravings, emotions and stress without turning to food for a quick fix endorphin hit. Learn how to recognise your eating triggers, understand why food doesn’t fix feelings and explore the links between emotion, bingeing and hunger. We'll talk less about kale and coconut water, and more about valuing your emotional health and supporting you through taking care of yourself. What’s included in Cake without Chaos? PRE-SESSION SUPPORT GUIDE + JOURNAL – you will start off learning 3 simple but brilliant frameworks then journalling out your personal insights. The intention of this guidebook is to provide you with foundational concepts that allow you to make connections on your own, ready to share and dig a little deeper on our 1:1 call. Guidebook takes approx. 30 mins to complete. 1 x 60-MIN 1:1 COACHING CALL – Our 1:1 call opens up a judgement free space for you to feel support, to be heard, and to help you uncover some of your own blind spots (we all have them!). I’ll help you form accountable, actionable, and achievable steps that give you more freedom, ease and connection to food and your body. POST-SESSION PRACTICES GUIDE – following our session, you’ll receive 2 of my favourite practices that support your transition from what you learnt in your pre-session guide and our 1:1 coaching session. These practices will help you continue to release food related anxieties and cycling behaviour. Guidebook takes approx. 20 mins to complete. Begin to gently decrease binge eating episodes and stop letting it take over important moments! Cultivate greater self awareness that leads to sustainable, long term health. I've walked my own journey with binge and emotional eating to find peace with food and my body and I’m super excited to help you do the same! Are you interested in working together? Here’s how to get started. Step 1. Click Book Now button above. You will be taken to a confirmation page where you can review the T&C's of the Cake without Chaos program then confirm your booking via Paypal's secure online payment system. Step 2. Head to your inbox where you will find a confirmation email with a prompt to schedule our session via the automatic scheduler. Once you have scheduled a time you'll automatically receive your pre-session guidebook! Step 3. I'll be in touch to help prepare you for our call and make sure you have your pre-session guidebook at least 3 days prior to our session commencing. Step 4. Following our session, you'll receive your follow up guidebook that prompts you to practice the key tools we've discussed. Let me know if you have questions, clarity on something or help getting started. The frequency of my binging has decreased dramatically. And, when I do binge, I am much more forgiving and able to move on from it. I am also fortunate to have a new resource for motivation, support, and education in Cake without Chaos!